Dusit Thani Dubai, Dusit International’s flagship property in the vibrant city of Dubai, announces the completion of the renovation of its One and Two Bedroom Suites. 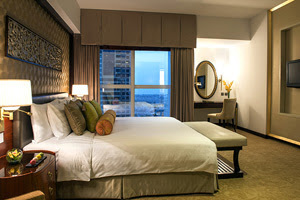 “After the renovation of the hotel’s Deluxe Rooms and Executive Suites in 2013, Dusit Thani Dubai takes pride in the completion of its One and Two Bedroom Suites, which is the final phase of the facelift in the hotel’s rooms and suites. The finished product has exceeded our expectations. Each suite exudes comfort and functionality, combined with bespoke touches of luxury and carefully-thought out details”, shared Prateek Kumar, general manager of Dusit Thani Dubai. The new transitional design offers five star luxury level lifestyle, with rooms that have been carefully replanned to allow better use of existing space. In keeping with the Thai principles of creating open spaces and bringing the “outside-inside” a full-height mirror wall has been utilized throughout to enhance the internal spaces, with all new fixtures and fittings, and soft furnishings custom-made to suit each apartment. The new design features both traditional Thai-inspired handcrafted timber casegood furniture, “floating” walls embellished with gold leaf mouldings, and intricate hand carved artwork, and sculptures, together with modern LED, and energy saving lighting, and the latest LCD television and media hub technology in all 147 rooms. This, coupled with striking Jim Thomson fabrics, rich carved effect wool carpets in a subtle design, sumptuous new sofas, vibrant seating design, and new luxury 10” pocketed sprung deep divan sets, offers the modern traveller who is design aware, but prefers style without show, and comfort with style. “The completion of the One and Two Bedroom Suites is just one of the hotel’s major projects in the pipeline. Also taking place this year is the introduction of two new food and beverage outlets and the spa facility. Dusit Thani Dubai continuously aim to uplift our guests’ experience not only by providing them with our unique gracious Thai hospitality but also by upgrading our facilities that suit their needs” shared Kumar.